Chloral hydrate (also known as trichloroacetaldehyde monohydrate and 2,2,2- trichloro-1,1-ethanediol) is a chemical used in the manufacture of other chemicals, including insecticides and herbicides. It is also used pharmeceutically as a seditive or hypnotic drug for the treatment of insomnia. 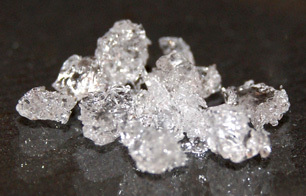 Chloral hydrate can arrive in drinking water in small amounts through formation as a by-product of water chlorination, or through manufacturing waste. Exposure to chloral hydrate can cause symptoms of gastric irritation such as nausea, vomiting and diarhea. Poisoning from large amounts can lead to life-threatening effects such as slowed breathing, decreased heart rates, lowered blood pressure, and deep coma. According to the World Health Organization, chloral hydrate may be treated with granular activated carbon (GAC). Its formation may also be prevented by filtering organic precursors from water prior to chlorination, or using alternate methods of disinfection. Sources: EPA, WHO, Wikipedia, IARC, Photo: Wikimedia, author: Danny S.